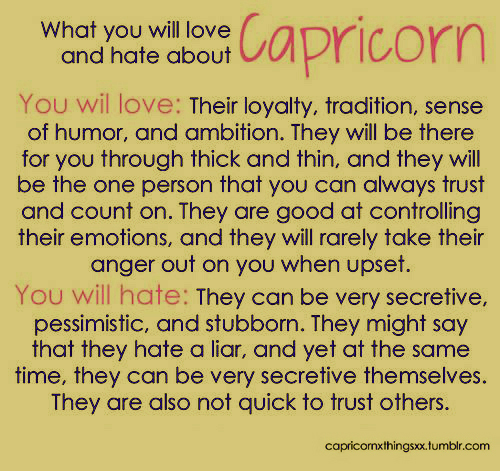 What You Will Love and Hate about Capricorn: | Capricorn Life - Capricorns Rock! You will Love: Their loyalty, tradition, sense of humor, and ambition. They will be there for you through thick and thin, and they will be the one person that you can always count on. They are good at controlling their emotions, and they will rarely take their anger out on you when upset. 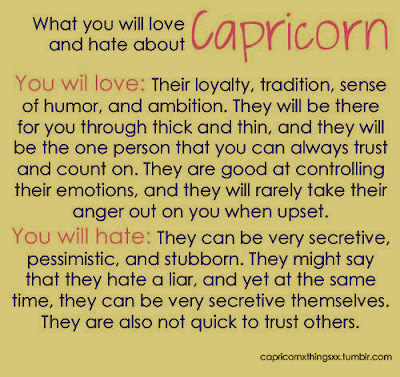 You will hate: They can be very secretive, pessimistic, and stubborn. They might say that they hate a liar and yet at the same time, they can be very secretive themselves. They are also not quick to trust others.